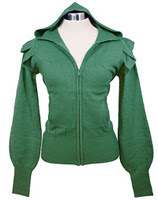 I couldn't resist this fantastical hoodie sweater from Swedish brand Tulle ($53). Outerwear is touted as their specialty, which I believe because somehow they've managed to make puffy sleeves completely necessary. The wide ribbing at the wrist and waist are more subtle details befitting a maiden. Bow and arrow sold separately.